When Kari Kampakis wrote a blog post in July 2013 titled “10 Truths Young Girls Should Know,” the post went viral and was shared more than 65,000 times on Facebook. Obviously her message strikes a chord with moms and dads across the country. 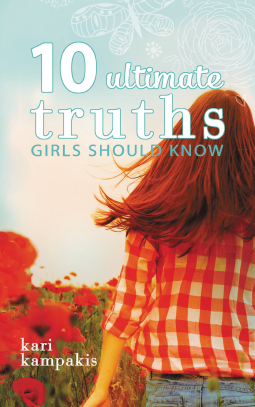 This nonfiction book for teen girls expands on these ten truths and brings a Christian message to the hearts of both moms and daughters. Kindness is more important than popularity. People peak at different times of life. Trust God’s plan for you. Get comfortable with being uncomfortable. Otherwise, you’ll never stick to your guns. Today’s choices set the stage for your reputation. You were born to fly. Fans of Kari's blog and newspaper column will not want to miss her first book. Filled with practical advice, loving support, and insightful discussion questions, 10 Ultimate Truths Girls Should Know is a timely and approachable list of guidelines that will help young girls navigate a broken world and become the young women God made them to be. In this book girls will learn the 10 ultimate truths girls should know such as, kindness is more important than popularity, you were born to fly, today's choices set the stage for your reputation, chasing boys doesn't make you cool. It makes you a nuisance, you weren't made to worship yourself, people peak at different times in life. Trust God's plan for you, get comfortable with being uncomfortable. Otherwise you'll never stick to your guns, boys are visual creatures. The clothing choices you make affect the way they see you, pretty girls are a dime a dozen. Outer beauty attracts attention, but inner beauty is what holds it and the source of all peace and happiness lives inside you. Learn to listen to the whispers of God over the megaphone of public opinion. I absolutely love this book and all that it teaches young girls. As the mother of three girls I know just how important each one the these 10 ultimate truths girls should know truly is. This book is something every young girl should read because it begins to teach girls about the broken world and how to become the young women God made them to be. I enjoyed reading this book very much and while my girls are too young to read it right now, it will be something that each one of them reads in the coming years. I highly recommend this book to all parents with young girls, as well as young girls themselves. You can find 10 Ultimate Truths Girls Should Know on Amazon, Barnes and Noble and other bookstores.